Of all the experiences in a young person’s life, college certainly ranks among the most exciting. For many, it’s their first time away from home; few other beginnings will be filled with so many new people, places and experiences. For parents, sending their children off into the world brings mixed emotions. Pride and happiness mix with the bittersweet thoughts of not having them around the breakfast table each morning. For parents of girls in particular, there’s another emotion that creeps in: Concern. And not without good cause. Hardly a week goes by that we don’t hear about the troublingly high rates of sexual assault on college campuses. 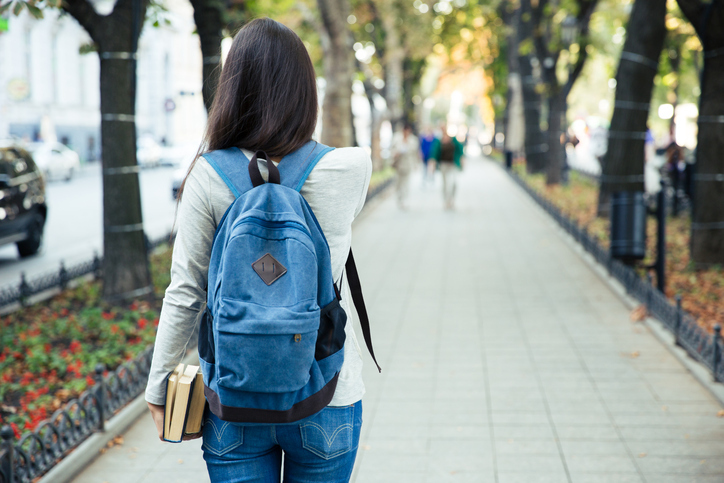 Campus size and location don’t seem to matter — from the largest and most prestigious universities to the smallest local, community colleges, recent statistics show that one in five women will experience some form of sexual assault while at college. And though the problem stretches across the board from first-year newcomers to established postgrad students, it is freshmen girls who are most at risk. As a newcomer to campus, unfamiliarity with the social norms of college life can be daunting. Freshmen are eager to feel included, find friends and form new relationships — a mindset that plays right into the hands of seasoned campus predators. A seemingly nice young man welcomes a new freshman to campus. His friendly manner puts her at ease. After the ice is broken, he casually mentions an upcoming party and extends a friendly invitation. When she arrives at the party, he greets her, offers her a drink (triple potency) and makes sure that for the rest of the evening her glass is never empty. Once it becomes obvious she’s feeling the effects of the alcohol, he suggests they go somewhere private. Once behind closed doors, in a secluded place, there’s little chance she’ll be able to stop the assault he had been planning all along. part of ensuring your daughter’s safety is to make her aware of the most common ruses she may face and the strategies she’ll need to protect against them. 1. Niceness does not equal trustworthiness. Start by teaching her the simple truth that niceness, in itself, is not the same as trustworthiness or goodheartedness. In situations like the one mentioned above, this otherwise positive social trait is deliberately used as a tactic to get a young woman to lower her guard and ultimately make her more vulnerable. Remind your daughter that while keeping an open mind when meeting new people is the right thing to do, the discipline of remaining appropriately cautious is equally important. 2. Drinking isn’t the problem; being out of control is. Alcohol plays a role in nearly every person’s college experience. But the drinking itself isn’t inherently the problem. It’s the absence of guidelines and the unwise decisions that follow which can lead to unsafe outcomes. When it comes to social drinking having a little food in the belly will help absorb alcohol and slow its affect. So, if she knows she’ll be having a few drinks later, she may want to have a quick bite to eat before going out. Drinking a glass of water between each alcoholic drink will also curb the alcohol’s effect and help keep her mindful of her drinking throughout the evening. Finally, she must avoid or at least limit extended participation in drinking games. Following these guidelines will allow her to participate and have fun while staying safe and in control. In nearly every case, sexual assault takes place behind closed doors. If your daughter feels unsure about a particular person or situation, make sure she knows that by avoiding isolation and staying in public view, she reduces her chances of getting into a bad situation by 99%. Avoiding being in a private place with someone she doesn’t know well, in some cases, may feel awkward. But until she is confident that she can trust him, it’s an essential rule for her safety. College is a time of adventure, discovery and wonder. Arming your daughter with these basic awarenesses will build her confidence and strengthen her resolve to stay safe and make smart decisions about her safety. 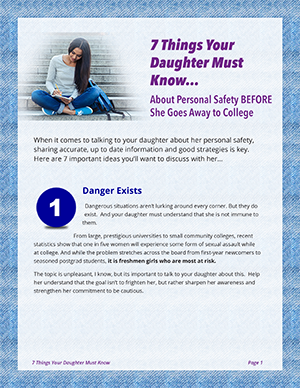 In addition, you’ll have the peace of mind that comes with knowing that from the moment she arrives on campus, she’ll have a strong set of safety skills she can rely on. This entry was posted in Safe Living on May 4, 2017 by Brad Michaels.